Eric A. Johnson. El terror nazi: la Gestapo, los judíos y el pueblo alemán. Barcelona: Paidós, 2002, 572 pages. Translated by Marta Pino Moreno. ISBN: 978-8449312922. 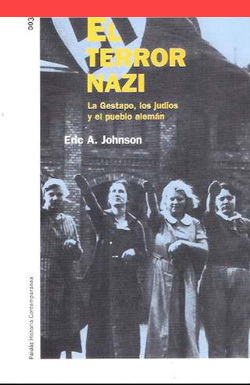 Spanish translation of the original title: Eric A. Johnson. Nazi Terror: The Gestapo, Jews, and Ordinary Germans. Basic Books, 2000. Published in Spanish by Paidós.